Meet Me Tonight in LA! The San Francisco event last night was amazing! A big hug to Lorraine and Peter first of all, from Chronicle, for being so awesome and helpful (love you guys!) 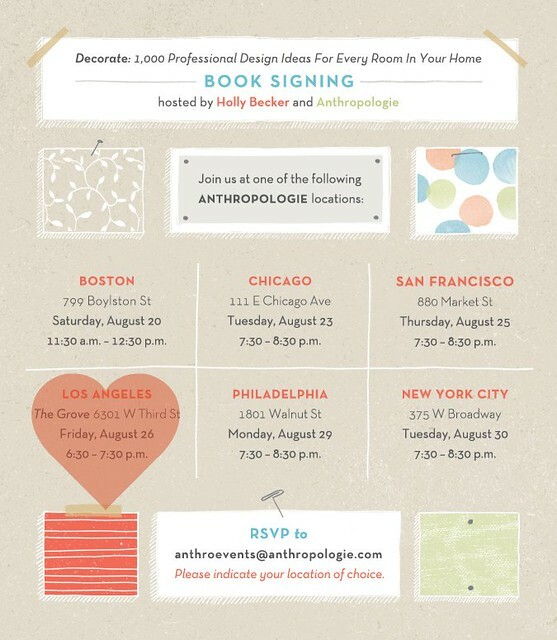 and next a big thanks to Anthropologie who put on quite a gorgeous event for Decorate! I'm off to the airport now to catch a flight to LA so tonight you can meet me at The Grove from 6:30-7:30 so stop by and say hello, get a copy of Decorate (they are sold out online and in most stores), and I'll sign your book and you can meet and mingle with my special guests and others who are coming by to join me. I am really looking forward to this evening so I'll see you all in LA! THANK YOU SAN FRANCISCO for such a mega welcome to your city - I felt so honored to meet all of you. Meet Me Tonight in San Francisco!